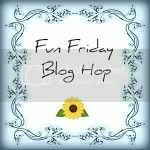 "Life with Twins and a Drama Queen" is hosting a Fun Friday Blog Hop. I'm new to following Edelis but when I saw her blog title I knew this was a mom blog I'd get a kick out of (despite not being a mom I do have some pretty rowdy nieces and nephews). So here's the Blog Hop. Come join and meet some new bloggers, get some more followers. Just enjoy and have fun! 1. You MUST follow GFC your hostess and co- host. If you already follow GFC you can always follow via Facebook, Twitter, Networkblogs. Make sure to leave us a comment and we WILL follow you back. 2. Feel Free to GRAB our button that is at the top and post it on your blog. We want to get the word out. 3. Post your URL and have fun! So jump on over and link up! Labels: Blog, Blog Hop, blogging, followers, friends, fun. So nice of you to help spread the word on this hop. It's one of my favorite one's I link up in. I'm now following you and I also wanted to say thanks for stopping by A Little Unhinged the other day.